In the world of gardening, pH both affects and is affected by everything. Indeed, the entire process of growing plants is a study in the physical dance of pH balance. The plant itself has a pH identity, with some plants being more acidic and others more alkaline, the water of different regions has a pH identity that is determined by a variety of environmental factors, and the soil of various regions also has a pH identity. So, how does the gardener master this dance of acid/alkaline polarity to bring forth a bountiful crop? The first step is gaining a basic understanding of pH, the needs of the particular crop, and the tools at hand to provide the optimum environment for that plant to prosper. While the physics of pH can indeed be complicated, they don't have to be. When preparing to grow the cannabis plant, it can comfort the grower to remember that cannabis is a hearty herb that has historically been considered a weed in horticultural circles. The cannabis plant wants to live, and will do its best to do so. The pH scale runs from 1 to 11, with lower numbers being acidic and higher numbers being alkaline. The cannabis plant prefers a pH environment of 5.5 to 6.5. When the pH environment rises in alkalinity above 7.5, the roots are not able to consume the available iron, copper, zinc, manganese, and boron ions in their vicinity, and when the pH lowers into acidity to less than 6 the roots are not able to access phosphoric acid, calcium, and magnesium because they lose their solubility. If the pH drops to between 5 to 3 with temperatures above 26 degrees Celsius fungal diseases become a threat to the plant. Savvy gardeners know that the success of their crop always starts with the condition of their soil. Sandy soils are acidic in nature, clay soils are alkaline. Woodland soil usually falls right in the middle, and is referred to as loam. One should remember, however, that since woodland soil is created by the process of decay of leaves, bark, and other organic debris, the top soil that is involved in this process will tend towards acidity. It is always best to conduct a simple pH test to determine the identity of the soil, and one's water as well. 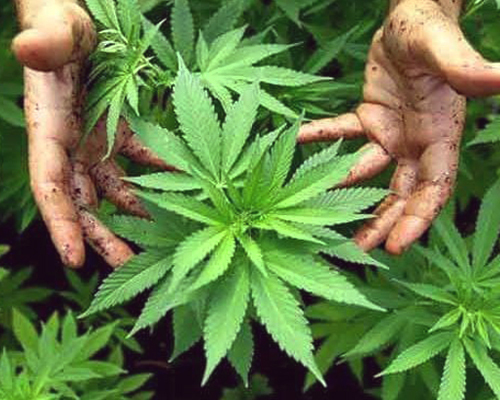 Growers of cannabis have praised the results of growing their crops in sandy loam soil, as the sand encourages good drainage and allows the roots to easily grow, while the loamy soil is rich in nutrients and holds water. Gardens with inherent clay soils are usually rich in nutrients, but need to be amended to create the conditions that will allow the plants to access those nutrients, as well as encourage roots to easily penetrate that tight clay. Organic methods of amending alkaline clay soil can be as simple as mixing leaves, chopped or ground pine needles, coffee grounds, and the contents of tea bags into the soil, but remember that these organic methods should be done in advance. It would be optimal to use this strategy of soil amendment starting the winter before planting to allow the amendments to decay and compost, and settle into the soil, making their pH adjustments. A quicker adjustment is made by mixing compost and sand into the soil. Sandy soil will provide great drainage, but has no ability to hold nutrients, so gardeners must amend this soil with a high quality compost to achieve the coveted sandy loam. Hydroponic systems are designed to simplify the process of growing one's crop. The grower checks their pH at least twice a day, and is able to quickly make adjustments. A basic pH of 6.0 will allow the plants to ebb and flow between 5.5 and 6.5. Gardeners of both indoor and outdoor crops should remember that the pH of their growing medium naturally changes as the plants consume their nutrients. This is the challenge of the pH dance. Experienced gardeners learn to read their plants, and can tell what they need by indicators such as the color of the leaves, the stance of the plant, and the plant's growth pattern. Yellow leaves indicate a lack of iron, indicating alkalinity, and acidic conditions will create burn spots on the leaves and a wilting stance. The main objective is making sure that the feminized cannabis plant has the necessary nutrients. Chelated plant food is chemically designed to be available to plants, and will assist the gardener throughout the ups and downs of the pH.